A telefactoring device; also known as the Waldo F. Jones Synchronous Reduplicating Pantograph. This story has been largely forgotten (even though it still makes great reading). The notion of a waldo, however, has not. The word itself has come into common usage; the American Heritage Dictionary describes it as follows: "A mechanical agent, such as a gripper arm, controlled by a human limb." 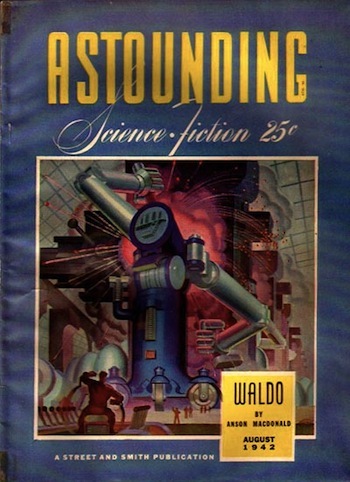 Real-life waldoes were developed for the nuclear industry during WWII; they were named after the invention described by Heinlein. This technology is known today by the more generic term "telefactoring"; it is used in a variety of industries. Waldo put his arms into the primary pair before him; all three pairs, including the secondary pair before the machine, came to life. Waldo flexed and extended his fingers gently; the two pairs of waldoes in the screen followed in exact, simultaneous parallelism. Heinlein shows his creativity by giving his character a problem (myasthenia gravis - degenerative muscle weakness) and then literally giving him the tool to solve it. You'll also enjoy his laboratory (in orbit, of course, to give Waldo maximum mobility). A pantograph is a device with a simple physical connection between a pointer and a drawing pen on a piece of paper. Altering the linkage between the pointer and the pen alters the scale of the drawing. The pantograph dates from 1630. Thomas Jefferson liked them; he built one into Monticello. In Oath of Fealty, by Larry Niven and Jerry Pournelle, telefactor operators who all live in the same arcology assist in a variety of tasks around the globe (and on the moon). At one point, they go on strike; a case of acting locally and globally.